I should preface this by saying that there is perhaps nobody in the world less qualified to write about cars than myself. Before marrying Anthony and sharing his Saab, I had an old Volkswagen, at least, I think it was a Volkswagen, but it might have been a Toyota. That's how much of a car person I am. Anyway, I had this car that was shaped like a milk carton tipped on its side. I named her "Sugar", because she was my sweet ride. Which is to say, she got me from Point A to Point B, and cured me forever of any fears I had of driving stick shift; once you can parallel park without power steering in a stick shift on a San Francisco hill, you can drive anywhere. One day, I ran into my downstairs neighbor, Joan, who is a fantastic handyman, except that she's a woman. She asked me how the steering felt in my car. What a coincidence that she should ask! Sugar had been driving like a dream for the past couple weeks. I told her, in amazement, that it was as if I suddenly had power steering! She looked at me oddly for a moment, until she finally decided that I was not in any way kidding or teasing her. And then she told me that two weeks earlier she had changed my tire for me, because it was so flat. I think she was wondering why I never thanked her, and at least during this conversation she had the epiphany that I wasn't ungrateful or rude, just utterly and hopelessly clueless about cars. So when I tell you that I love seeing vintage cars around Paris, a vintage city, you should know that they very well may not be vintage cars at all. They could have come off a factory line yesterday. But they look adorable and old to me. Yet even I can identify the era of this vehicle -- A US army Jeep from World War II, which I presume is authentic. And this rusty old thing in the middle of the streets -- and I don't mean my friend, Barry; I mean the car. 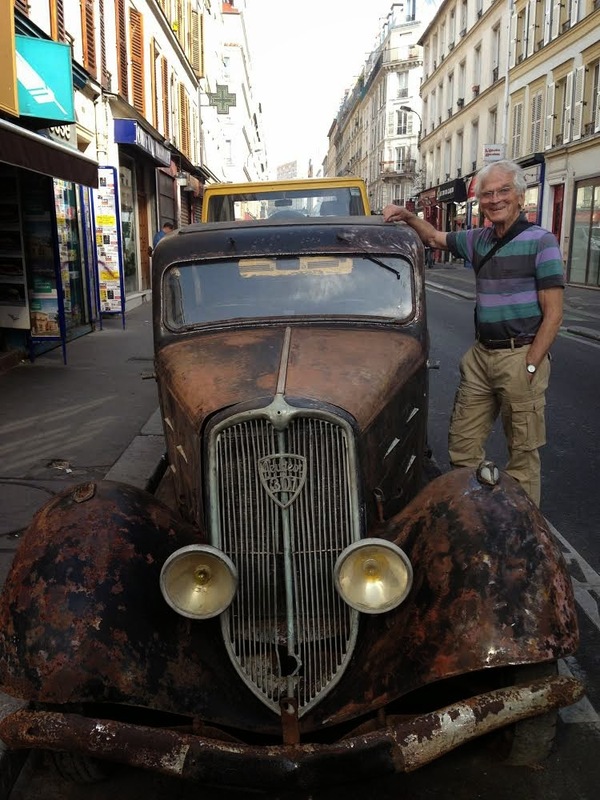 Barry is an 86-year old friend and reader who visits Paris annually, and he's anything but rusty. The other day, he walked from Ile St. Louis to Montmartre. Even I wouldn't do that walk on a normal day. But he and his partner-in-crime Judith spotted this car and couldn't resist. 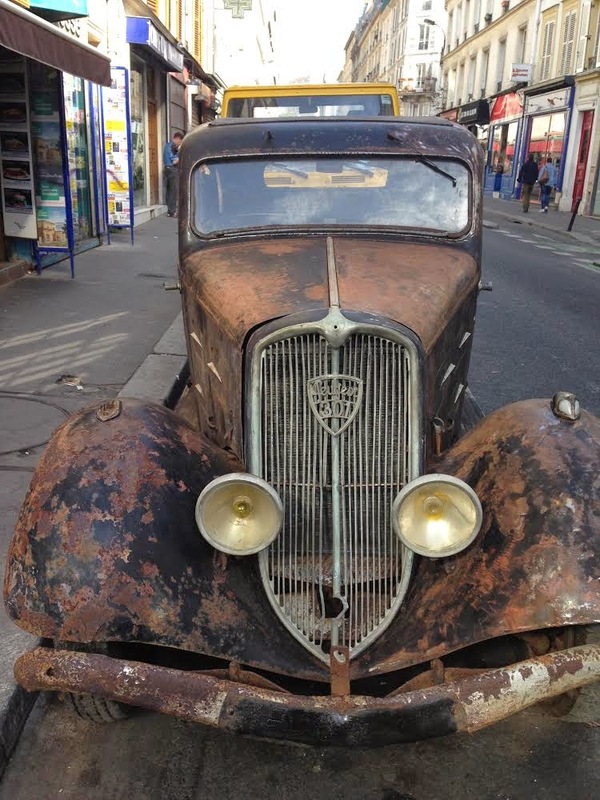 So at least I know it's not just me that's entranced by these sweet old rides toodling around Paris' streets. These guys are on their way to an old car convention, so I'm pretty sure they're the real deal. And these, frankly, may not be anything. But just look at how atmospheric they are. And this motorcycle, which is probably not vintage at all. But it's adorable, and I love the look of it against the Montparnasse neighborhood background. Both Cantal and Salers, two classic, old, mountain cows' milk cheeses can be made from the milk of any breed of cow and still meet their AOP requirements. However, this cheese is slightly more specific: a farmhouse Cantal au Lait de Salers, made a Cantal made specifically with milk from the Salers breed cow (Salers being a place and a breed of cow, as well as a cheese name). In addition, some Cantals are made from pasteurized milk, but this cheese is a raw milk. 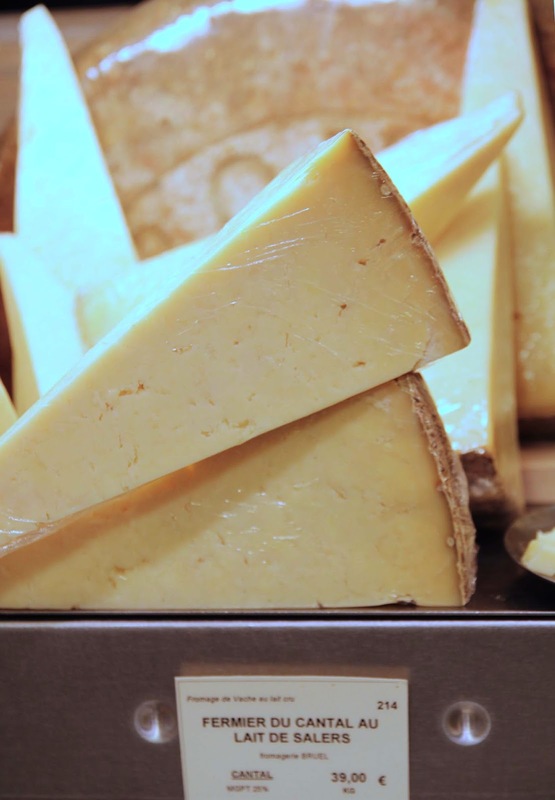 And you would think, with all of that in its background, it would be stronger, earthier, and heartier than a regular Cantal or Salers. But you would be wrong. In fact, it's a semi-hard cheese that reminds me more of an American-style Edam -- slightly rubbery and mild. It's nice enough to taste a free sample, and I'm sure it's fine on a sandwich, but it's just not exciting enough to buy. Cantal au Lait de Salers is a combination of two classics: Salers milk in the style of a Cantal cheese, just like this story is about a combination of two classics: classic vehicles set against the backdrop of a classic city.